BARCELONA – In recent months, the dichotomy between booming financial markets, on the one hand, and sluggish economies and dysfunctional politics, on the other, has loomed large. Yet insufficient attention is being devoted to a critical factor – time, and who controls it – that could well mean the difference between an orderly global resolution of today’s growing inconsistencies and a return to a more troubled phase. Markets have been understandably buoyant in the first quarter of 2013. Most economic data confirm that, after the trauma caused by the global financial crisis, the United States’ economy is healing, and doing so in an accelerated fashion. After flirting with disaster last July, interest-rate spreads for eurozone bonds have generally been subdued, and financial segmentation has been slowly reversed (that is, at least before European officials embarked on the controversial path of trying to impose losses on guaranteed bank deposits in Cyprus). Moreover, as Ireland’s highly successful €5 billion ten-year bond issue in mid-March demonstrated, some countries are in the process of restoring normal access to capital markets. The impact on markets of these trends has been turbocharged by central banks, which are risk markets’ best friends. This is not because they wish to play that role; rather, it is because higher asset prices are essential if central bankers stand any chance of delivering the desired economic outcomes of higher growth and stronger job creation. This is most evident in the US, where markets love the Federal Reserve’s trifecta of near-zero policy interest rates (negative in real terms), aggressive forward policy guidance, and asset purchases – all of which push investors to take more risk. Markets also welcome the fact that the Fed’s hyperactive experimentation is forcing other central banks around the world to pursue more expansionary policies. Indeed, from the Bank of Japan’s dramatic policy U-turn to the Bank of Mexico’s surprise interest-rate cuts, the Fed’s approach is affecting central banks in a growing number of countries. Pushed further away from best-case scenarios, they are unable to ignore the global liquidity impact of the Fed’s policies, yet they lack the right policy tools to address it. The mix of endogenous healing and strong central-bank tailwinds, including from a “whatever it takes” European Central Bank, has also helped markets shrug off troubling political uncertainties. Be it the US Congress’s paralyzing polarization or Italy’s protest vote against the established political order, politicians are being given time to overcome their dysfunction, thereby minimizing any immediate disruptive impact. The excitement is not anxiety-free, however, and rightly so. Investors worry about the longer-term consequences of political dysfunction, another year of European economic contraction, disastrously high unemployment, unprecedented – and thus untested – central bank policies, and increasing global tensions. And the recent bungling of the Cyprus rescue does not help. No wonder some have called the recent market rally “one of the most unloved” in history. The other road is a lot less attractive. With insufficient endogenous healing and no economic escape velocity, the effectiveness of central banks’ policies wanes and political dysfunction increases, leading to financial losses, volatility spikes, and huge risk-management challenges. Given current policy and political uncertainties – and the multiple equilibria that they entail – it is difficult to predict with a high degree of confidence which road eventually will be taken and when. Those who claim otherwise may well fail to appreciate fully the exceptional nature of the current situation. Have no doubt: today’s markets rely heavily on the old adage that “time heals all wounds.” The timekeepers are central banks. But their control of the clock is less than perfect; and it will become increasingly ineffective if economic improvement faces additional political headwinds in the months ahead. 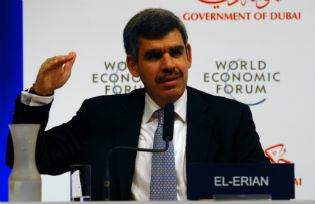 Mohamed A. El-Erian is CEO and co-Chief Investment Officer of the global investment company PIMCO, with approximately $2 trillion in assets under management. He previously worked at the International Monetary Fund and the Harvard Management Company, the entity that manages Harvard University’s endowment. He was named one of Foreign Policy’s Top 100 Global Thinkers in 2009, 2010, 2011, and 2012. His book When Markets Collide was the Financial Times/Goldman Sachs Book of the Year and was named a best book of 2008 by the Economist.